COSTA MESA, CA--(Marketwired - September 30, 2015) - As its global customer base calls for higher frequencies in smaller packages, Ecliptek Corporation has added four new Temperature Compensated Crystal Oscillators (TCXO) and four new Temperature Compensated Voltage Controlled Crystal Oscillators (TCVCXO) to its extensive frequency control product line. The new LVCMOS oscillator series offer frequency stability options as tight as ±1.0ppm in a miniature 2.5mm x 3.2mm ceramic six pad SMD package. Ecliptek's eight new series, available in commercial, extended commercial, or industrial temperature range options are ideal for a wide range of circuit applications including clock recovery and synchronization, reference signal tracking, and digital switching. These miniature TCXO and TCVCXO series provide excellent phase jitter performance. Applications include Ethernet, HCF Equipment, Fiber channel, Audio/Video, and customer premises equipment. Comprehensive part number specific information derived from these new series is integrated into Ecliptek's interactive website tools, including the SmartSearch and My Parts List apps. Ecliptek's advanced self-service documentation tools provide easy access to Data Sheets, REACH, RoHS, China RoHS, IPC-1752 Material Declarations, Qualification and Reliability Reports, and Conflict Mineral documentation on over 3 million verified Ecliptek part numbers. 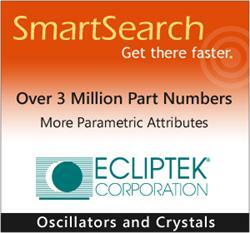 Founded in 1987, Ecliptek has become a leading supplier of frequency control products to the electronics industry. Ecliptek provides complete engineering support, unparalleled customer service, and innovative products to their OEM customers and distributors worldwide. Complete information on company operations or any of Ecliptek's quality frequency control devices can be obtained by visiting Ecliptek's internet site at www.ecliptek.com. The company's Email address is customersupport@ecliptek.com.